Tantalum from coltan is used to manufacture batteries for electric cars and, in tantalum capacitors, it is used in electronic products. Coltan mining has helped to finance serious conflict in the Democratic Republic of Congo, for example the Ituri conflict and the Second Congo War. Approximately 71% of global tantalum supply in 2008 was newly mined, 20% was from recycling, and the remainder was from tin slag and inventory. Tantalum minerals are mined in Colombia, Australia, Brazil, China, Ethiopia, and Mozambique. Tantalum is also produced in Thailand and Malaysia as a by-product of tin mining and smelting. Potential future mines, in descending order of magnitude, are being explored in Egypt, Greenland, China, Australia, Finland, Canada, Nigeria and Brazil. Globally, 60% of all mining companies have registered with the lightly regulated stock exchanges in Toronto and Vancouver. However, due to environmental regulations no mining of coltan is currently taking place in Canada itself, with the exception of a single proposed mine in Blue River, British Columbia. In Canada, Tanco Mine near Bernic Lake in Manitoba has tantalum reserves but today it is the world's largest producer of caesium, it is operated by Cabot Corporation, which bought it in 1993. Cobalt, Ontario formerly produced cobalt as a byproduct of its silver mines, but there has been no mining in the area since the 1980s. In 2017 one mill still operated and the mayor has invited investment from companies who are interested in refining the slag on abandoned mine sites. A discussion updated in 2017 of Canadian mining by Natural Resources Canada does not mention either coltan or tantalum. A Rwandan official discussing prospective mines in his country said that Canada had 4% of global production in 2009; but in rock so hard that the ore is too expensive to extract. In 2009, Rwanda had 9% of the world’s tantalum production. In 2016 Rwanda accounted for 50% of global tantalum production. In 2016, Rwanda announced that AB Minerals Corporation would open a coltan separation plant in Rwanda by mid-2017, the first to operate on the African continent. Uganda and Rwanda both exported coltan in the early 2000s after they invaded the DRC, but the coltan came from mines in the DRC, according to the final report of the UN Panel of Experts on the Illegal Exploitation of Natural Resources and Other Forms of Wealth in the Democratic Republic of Congo. In 2013 Highland African Mining Company (HAMC), now Noventa, closed its Marropino mine in the Gilé District of Zambézia Province, Mozambique, citing poor-quality infrastructure and ore that was both very radioactive and mostly depleted. HAMC was losing US $3.00 on every ton extracted and had reported accumulated losses of around US$150 million by June 2013. Reserves have been identified in Afghanistan, but the ongoing war there precludes either general exploration or exploring specifically for coltan for the foreseeable future. The United States does not produce tantalum due to the poor quality of its reserves. Australian mining company Sons of Gwalia once produced half the world's tantalum but went into administration in 2004. Talison Minerals paid $205 million to buy the Wodgina and Greenbushes tantalum business of Sons of Gwalia but temporarily closed Wodgina because of falling tantalum prices. The mine re-opened in 2011 but closed again after less than a year. Atlas Iron began mining iron ore there in 2010 and ceased operations there in April 2017. Global Advanced Mining announced in 2018 that it planned to restart tantalum production at the Greenbushes mine within a year. Talison Lithium, 51% owned by Chinese company Tianqi Lithium Industries, Inc. (SZSE:002466) and 49% by the US-based Albemarle Corporation, will continue to mine lithium at Greenbushes in parallel with the GAM tantalum operation. Venezuelan President Hugo Chavez announced in 2009 that a significant reserve of coltan was discovered in western Venezuela, although at least one coltan mining operation had previously been authorized in the area. Nonetheless he outlawed private mines in the region and, saying that the FARC was financing itself with illegal mining, sent 15,000 troops in to deal with them. Technical advisers for the mining project were allegedly provided by a subsidiary of Khatam-al Anbiya Construction Headquarters, a wholly owned enterprise of the Iranian Revolutionary Guard which had been under US sanctions since October 25, 2007. Also in 2009, the Colombian government announced coltan reserves had been found in Colombia's eastern provinces. Director of the Colombian Police Oscar Naranjo Trujillo stated in October 2011 that the FARC and the Sinaloa Cartel are working together in the unlicensed coltan mining in Colombia. Colombia announced a joint operation with the United States to arrest three suspects who, according to Semana, inherited the illegal business run from their brother, Francisco Cifuentes Villa, alias ‘Pancho Cifuentes,’ who once worked for Pablo Escobar. In 2012 Colombian police seized 17 tons of coltan in Guainía Department. The police said it had been mined on an indigenous reserve and bought for $10 a kilo and sold it for $80 to 100 dollars a kilo, after smuggling it across the border into Brazil, where there are smelters, and sold on through the black market to buyers in Germany, Belgium, Kazakhstan and the United States. Colombia has 5% of global coltan reserves. 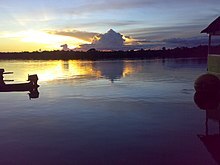 One of the regions suffering from illegal gold and coltan mining in Colombia is the wetland known as Estrella Fluvial del Inírida (Inírida Fluvial Star), a Ramsar protected wetland. The United States responded to conflict minerals with section 1501 of the Dodd-Frank Act, which required that companies who might have conflict minerals in their supply chain to register with the US Securities and Exchange Commission disclose their suppliers. Reaction to this legislation was mixed. Based on extensive qualitative fieldwork conducted from 2014 to 2016 with coltan buyers operating in Bukama Territory, Kalemie and Lubumbashi, Katanga Province, one researcher suggested that conflict mineral reforms resulted in better oversight and organization of supply chains, but that inaction by the Congolese government had led to locally negotiated solutions and territorialization which obscure access criteria. 2005-2009: MYB 2009, p. 52.13. USGS did not report data for other countries (China, Kazakhstan, Russia, etc.) owing to data uncertainties. N/A Not available. — Zero. Coltan is used primarily for the production of tantalum capacitors, used in many electronic devices. Many sources mention coltan's importance in the production of mobile phones, but tantalum capacitors are used in almost every kind of electronic device. Niobium and tantalum have a wide range of uses, including refractive lenses for glasses, cameras, phones and printers. They are also used in semiconductor circuits, and capacitors for small electronic devices such as hearing aids, pacemakers, and mp3 players, as well as in computer hard drives, automobile electronics, and surface acoustic wave (SAW) filters for mobile phones. Coltan is also used to make high-temperature alloys for jet engines and air- and land-based turbines. More recently, the nickel-tantalum superalloys used in jet engines account for 15% of tantalum consumption, but pending orders for the Airbus and the 787 Dreamliner may increase this proportion, as well as China's pending order for 62 787-8 airplanes. Certain countries rich in natural resources have been said to suffer from the apparently paradoxical "resource curse" - showing worse economic development than countries with fewer resources. In the case of the Congo, this can possibly be explained by historical and modern invasion and colonization, which prevents the Congolese from implementing a balanced and sustained development. Wealth of resources may also correspond to "…the likelihood of weak democratic development, corruption, and civil war". High levels of corruption lead to great political instability, because whoever controls the assets (usually the political leaders and the government, in the case of the Democratic Republic of the Congo) can use them for their own benefit. The resources generate wealth, which the leaders use to stay in power "…either through legal means, or coercive ones (e.g. funding militias)". The increased importance of coltan in electronics "occurred as warlords and armies in the eastern Congo converted artisanal mining operations…into slave labour regimes to earn hard currency to finance their militias," as one anthropological study put it. When much of eastern Congo came under the control of Rwandan forces in the 1990s, Rwanda suddenly became a major exporter of coltan, benefiting from the weakness of the Congolese government. [need quotation to verify] The soaring price "brought in as much as $20 million a month to rebel groups" and other factions trading coltan mined in northeastern Congo, according to a U.N. report. The tantalum extracted from coltan is used to make tantalum capacitors, an important component of modern electronics. In late 2000, huge demand for the newly introduced PlayStation 2 caused the price of coltan to spike. When market saturation later caused a drop in consumer demand for the gaming system, the price of coltan dropped as well. The price hike intensified violence in Eastern Congo, as the violence was being directed at everyday "social production". For Congolese, mining is the readiest source of income, because the work is consistently available, even if only for a dollar a day. The work can be laborious; miners can walk for days into the forest to reach the ore, scratch it from the earth with hand tools and pan it. About 90% of young men[dubious – discuss] in Congo do this. Research found that many Congolese leave farming because they need money quickly and cannot wait for crops to grow. Farming also presents its own obstacles. For example, the lack of roads in the Congolese interior makes it extremely difficult to transport produce to market and a harvest can be seized by militias or the military. With their food gone, people resort to mining to survive. But organized mines may be run by corrupt groups such as militias. The Congolese mine coltan with few tools, no safety procedures, and often no mining experience. No government aid or intervention is available in many unethical and abusive circumstances. Miners consider coltan mining a way to provide for themselves in the face of widespread war and conflict and a government that has no concern for their welfare. A 2007 study of the radioactivity of the coltan mined in Masisi and other parts of the North Kivu Province found "that grinding and sieving coltan can give rise to high occupational doses, up to 18 mSv per annum on average." Conflicts, including the Rwandan occupation of the eastern Democratic Republic of Congo (DRC), have made it difficult for the DRC to exploit its coltan reserves. Mining of coltan is mainly artisanal and small-scale and vulnerable to extortion and human trafficking. A 2003 UN Security Council report stated that much of the ore is mined illegally and smuggled across Congo's eastern border by militias from neighbouring Uganda, Burundi and Rwanda. All three countries named by the United Nations as coltan smugglers denied doing this. Austrian journalist Klaus Werner [de] however has documented links between multi-national companies like Bayer and the smuggling and illegal coltan mines. A United Nations committee investigating the plunder of gems and minerals from the Congo, listed[when?] in its final report approximately 125 companies and individuals whose business activities breach international norms. Companies accused of irresponsible corporate behavior included Cabot Corporation, Eagle Wings Resources International the Forrest Group and OM Group. Some of the fighters were eventually tried before the International Criminal Court tribunal in The Hague on charges of crimes against humanity. Income from coltan smuggling likely financed the military occupation of Congo, and prolonged the civil conflict afterwards. A UN panel studied the eastern Congo for months before releasing a remarkably sharp condemnation of the ongoing military occupation of eastern Congo by Ugandan, Rwandan, and other foreign military forces, as well as the many bands of Congolese rebels fighting with one another. The UN report accused the fighters of massively looting Congolese natural resources, and said that the war persisted because the fighters were enriching themselves by mining and smuggling out coltran, timber, gold, and diamonds. They also said that smuggled minerals financed the fighting and provided money for weapons. A 2005 report on the Rwandan economy by the South African Institute for Security Studies found that Rwanda official coltan production soared nearly tenfold between 1999 and 2001, from 147 tons to 1,300 tons, and for the first time provided more revenue than from the country traditional primary exports, tea and coffee. Similarly, Uganda exported 2.5 tons of coltan exports a year before the conflict broke out in 1997. In 1999 its export volume exploded to nearly 70 tons. the opening of new mines in Rwanda. Many of the corporations participating in the 1999-2000 business stampede caused by $400 coltan were in fact participants in the conflict. The Rwandan army, as Rwanda Metals, exported at least 100 tons per month. A UN panel estimated that the Coltan extraction causes problems that adjoin or overlap those caused by blood diamonds and uses similar methods such as smuggling across the porous Rwandan border, environmentalists and human rights workers began to speak of "conflict minerals" or "conflict resources" more generally. It is difficult to verify the sourcing of fungible materials like ores, so some cobalt processors, Cabot Corporation (USA) for example, have announced that they would avoid unsourced Central African coltan altogether. The Rwandan army could have made $20 million a month, and must have made at least $250 million over 18 months. "This is substantial enough to finance the war," the panel noted in its report. "Here lies the vicious circle of the war. In 2009 DRC coltan was going to China to be manufactureded into wires and electronic-grade tantalum powder. Coltan imports from the DRC into Europe usually went to Russia or Central/Eastern Europe, via the route through Dar es Salaam in Tanzania and Piraeus in Greece to the Balkans. An offshore consortium registered in British Virgin Islands named Nova Dies controlled most of the trans-Balkan trade route. [unreliable source?] This export pipeline mostly carries unprocessed coltan mined in unsafe artisanal mines, so this market hinders development of safer extraction infrastructure in the DRC. The Balkan trade route therefore poses a long-term threat to the DRC's economy; it finances and validates the vast harm done to DR Congo by the violent and corrupt past and current system. Estimates of Congo's coltan deposits range upwards from 64% of global reserves. but estimates at the high end of the range are difficult to trace to reliable data. Professional bodies like the British Geological Survey estimate that Central Africa as a whole has 9% of global assets. Tantalum, the primary element extracted from coltan, can also be obtained from other sources, but Congolese coltan represented around 10% of world production in 2008. Uncontrolled mining in the DRC causes soil erosion and pollutes lakes and rivers, affecting the hydrology and ecology of the region. The eastern mountain gorilla's population has diminished as well. Miners, far from food sources and often hungry, hunt gorillas. The gorilla population in the DRC fell from 17,000 to 5,000 in the decade prior to 2009, and Mountain Gorillas in the Great Lakes region numbered only 700, UNEP said in 2009. Hunted for bushmeat, a prized delicacy in western Africa, and threatened by logging, slash-and-burn agriculture and armed conflict, the gorilla population was critically endangered, they said. The population of Grauer's gorillas were particularly threatened by changes in their environment, with a population in January 2018 of only about 3,800. An estimated 3–5 million tons of bushmeat is obtained by killing animals, including gorillas, every year. Demand for bushmeat comes from urban dwellers who consider it a delicacy, as well as from remote populations of artisanal miners. Environmentalists who interviewed miners in and around Kahuzi-Biéga National Park and the Itombwe Nature Reserve found that the miners did confirm that they had been eating bushmeat and that they did think that the practice had caused a decline in primate numbers. Since the miners said they would cease the practice if they had another food supply, the authors suggested that efforts to stop the gorilla population decline should consider addressing this issue to reduce the depradations of subsistence hunting. The mines in these nature reserves were producing cassiterite, gold, coltan and wolframite, and "most mines were controlled by armed groups." In addition to environmental harm caused by erosion, pollution and deforestation, agriculture and as a result food security suffered in the DRC as a result of mining. A followup UN report in 2003 noted a sharp increase in 1999 and 2000 in the global price of tantalum, which naturally increased coltran productions. Some of the increased production came from eastern DC where "rebel groups and unscrupulous business people" forcing farmers and their families to leave land where the rebels wanted to mine, "forcing them to work in artisanal mines...widespread destruction of agriculture and devastating social effects occurred, which in a number of instances were akin to slavery. A shift also took place from traditional sources such as Australia to new suppliers such as Egypt, perhaps because of the bankruptcy of the world's biggest supplier, Australia's Sons of Gwalia may have caused or contributed to this change. The operations previously owned by Gwalia in Wodgina and Greenbushes continue to operate in some capacity. ^ "The VICE Guide to Congo | VICE United States". Vice.com. Retrieved 2013-04-29. ^ "IRC Study Shows Congo's Neglected Crisis Leaves 5.4 Million Dead; Peace Deal in N. Kivu, Increased Aid Critical to Reducing Death Toll". 22 January 2008. Retrieved 17 April 2011. ^ JOHN LASKER (October 29, 2009). "Digging for Gold, Mining Corruption: One of Africa's Poorest and Most Embattled Countries is Prey to Canadian Mining Companies Searching for the Last Great Gold mine". ^ Thomas R. Yager. "The Mineral Industry of Rwanda" (PDF). 2009 Minerals Yearbook: RWANDA. U.S. Department of the Interior, U.S. Geological Survey. ^ "Africa's first Coltan separation plant to be built in Rwanda". CNBC Africa. August 24, 2016. Retrieved March 25, 2018. ^ "Uganda indicted for plunder of natural wealth:Congo report: Uganda indicted for plunder of natural wealth". New Vision. 24 October 2002. Archived from the original on March 4, 2018. ^ Michael Nest (2013). Coltan. John Wiley & Sons. p. 1990. ISBN 978-0745637716 – via Google Books. ^ "Highland African Mining Company closes mine in Marropino, Mozambique". MacauHub. 2 August 2013. ^ Michael Skinner (27 February 2009). "Multi-billion Dollar Mining Boom: The economics of war and empire in Afghanistan". Global Research. Retrieved 29 April 2013. ^ DONALD G. McNEIL Jr. (June 19, 2010). "Next for Afghanistan, the Curse of Plenty?". New York Times. ^ KATIE DRUMMOND (June 4, 2010). "NO, THE U.S. DIDN'T JUST 'DISCOVER' A $1T AFGHAN MOTHERLODE (UPDATED)". Wired. ^ "Niobium (Columbium) and Tantalum: Statistics and Information". USGS. 2018. ^ Nick Evans (17 April 2017). "Worm turns for Atlas as Wodgina, ore prices conspire against it". The West Australian. ^ Emilia Díaz-Struck; Joseph Poliszuk (March 4, 2012). "Venezuela emerges as new source of 'conflict' minerals". International Consortium of Investigative Journalists. Retrieved May 12, 2016. ^ "Sinaloa Cartel Expands Influence in Colombia". Insight Crime. March 2, 2011. ^ "Carteles mexicanos estarían detrás de coltán incautado en Colombia: Una alianza entre capos de ese país y grupos ilegales de nuestro país estaría explotando el mineral que es sacado hacia Brasil" [Mexican cartels said to be behind Coltan seizure in Columbia: An alliance between capos of that country and illegal groups of our country said to be exploiting the ore that is taken to Brazil.] (in Spanish). Semana. September 13, 2012. ^ "Estrella fluvial de Inírida un paraíso amenazado por la minería" [Inírida fluvial star, a paradise threatened by mining] (in Spanish). Semana. ^ "La selva herida por la minería: Colombianos y extranjeros están afectando la frágil geografía de la Orinoquia y la Amazonia, afiebrados por la ambición del oro y del coltán" [The jungle wounded by mining: Colombians and foreigners are affecting the fragile geography of the Orinoquia and the Amazon, fevered by the ambition of gold and coltan] (in Spanish). March 29, 2013. ^ Nathan Jaccard (4 May 2016). "Las estrellas del Inírida" [The stars of the Inírida]. El Espectador. ^ Diemel, J.A. (12 February 2018). "Authority and access to the cassiterite and coltan trade in Bukama Territory (DRC)". The Extractive Industries and Society. 5 (1): 56–65. doi:10.1016/j.exis.2017.12.001. ^ 1990-1993: U.S. Geological Survey, 1994 Minerals Yearbook (MYB), "COLUMBIUM (NIOBIUM) AND TANTALUM" By Larry D. Cunningham, Table 10; 1994-1997: MYB 1998 Table 10; 1998-2001: MYB 2002 p. 21.13; 2002-2003: MYB 2004 p. 20.13; 2004: MYB 2008 p. 52.12; 2005-2009: MYB 2009 p. 52.13. USGS did not report data for other countries (China, Kazakhstan, Russia, etc.) owing to data uncertainties. .
^ "Applications for Tantalum". Retrieved 2008-06-03. ^ Tiffany Ma. "China and Congo's coltan connection" (PDF). Futuregram. Project 2049 Institute. p. 5 – via Google Scholar. ^ Boeing. "Boeing's orders and deliveries information (as of May 2009)". ^ a b Humphreys; et al. (2007). Escaping the Resource Curse. New York: Columbia University Press. p. 1. ^ Humphreys; et al. (2007). Escaping the Resource Curse. New York: Columbia University Press. pp. 10–11. ^ a b Mantz, J. W (2008). "Improvisational economies: Coltan production in the eastern Congo". Social Anthropology. 16: 34–50. doi:10.1111/j.1469-8676.2008.00035.x. ^ David van Reybrouck (2012). Congo: The Epic History of a People. HarperCollins. p. 456f. ISBN 978-0-06-220011-2. ^ Billy Batware (December 5, 2011). The Role of Multinatinal Corporations in the Democratic Republic of the Counge (PDF) (Report). ACUNS. ^ a b c d Smith, James H. (February 1, 2011). "Tantalus in the Digital Age: Coltan ore, temporal dispossession, and "movement" in the Eastern Democratic Republic of the Congo". American Ethnologist. 38 (1): 17–35. doi:10.1111/j.1548-1425.2010.01289.x. ^ a b Jackson, Stephen. "Making a killing: criminality and coping in the Kivu war economy". Review of African Political Economy. ROAPE Publications. Retrieved 28 January 2013. ^ Dorner, Ulrike; Franken, Gudrun; Liedtke, Maren; Sievers, Henrike (2012-03-01). "Artisanal and Small-Scale Mining (ASM)" (PDF). Retrieved 2012-09-09. ^ "Security Council Condemns Illegal Exploitation of Democratic Republic of Congo's Natural Resources" (Press release). UN. 3 May 2001. Retrieved 2008-05-12. ^ Werner, Klaus (2003). Das neue Schwarzbuch Markenfirmen [The New Black Book of Brand Companies] (in German). ISBN 978-3-216-30715-6. ^ Friends of the Earth-United States (2004-08-04). "FOE complaint to Department of State concerning U.S. companies". Retrieved 2009-05-15. ^ Friends of the Earth-United States (2004-08-04). "Groups File Complaint With State Department Against Three American Companies Named in UN Report". Retrieved 2009-05-15. ^ Emizet Francois Kisangani; Scott F. Bobb (2009). Historical Dictionary of the Democratic Republic of the Congo (3 ed.). Scarecrow Press. p. 91. ISBN 978-0810863255. ^ "Congo in talks with Malaysia Smelting over tin foundry". Reuters. October 3, 2011. ^ "The Democratic Republic of the Congo: Major Challenges Impede Efforts to Achieve U.S. Policy Objectives; Systematic Assessment of Progress Is Needed" GAO-08-562T" (PDF). March 6, 2008. ^ Nest, Michael (2013). Coltan. New York: John Wiley & Sons. ^ Richard Shaw; Kathryn Goodenough. "Niobium-tantalum". British Geological Survey. Retrieved 24 May 2014. ^ "'Coltan' | Tantalum-Niobium International Study Center". Tanb.org. Retrieved 2013-04-29. ^ Taylor and Goldsmith, Andrea and Michele (December 2002). Gorilla Biology: A Multidisciplinary Perspective. ISBN 978-0-521-79281-3. Retrieved 2010-11-19. ^ Louise Gray (December 2, 2008). "Jane Goodall issues call to save gorillas: Jane Goodall, the famous conservationist, has called on the world to protect gorillas under threat from ongoing deforestation and war". The Telegraph. ^ "One of the world's rarest apes faces extinction". Veld & Flora. 103 (4): 150. January 2018. hdl:10520/EJC-c236ee9d4. ISSN 0042-3203. ^ Charlotte Spira; Andrew Kirkby; Deo Kujirakwinja; Andrew J. Plumptre (11 April 2017). "The socio-economics of artisanal mining and bushmeat hunting around protected areas: Kahuzi–Biega National Park and Itombwe Nature Reserve, eastern Democratic Republic of Congo". Oryx. 53 (1): 136–144. doi:10.1017/S003060531600171X. ^ Tantalum-Niobium International Study Center. "Tantalum". Retrieved 2008-01-27. 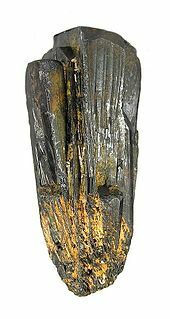 Look up coltan in Wiktionary, the free dictionary. Wikimedia Commons has media related to Columbite-Tantalite. High-Tech Genocide in Congo, by Keith Harmon Snow. Conflict Minerals Company Rankings, technology company classification surveying their compromise to avoid the use of "conflict minerals". Report from Raise Hope for Congo information campaign, of Enough Project. Can the provenance of the conflict minerals columbite and tantalite be ascertained by laser-induced breakdown spectroscopy?